Do you have any idea how long it takes for kids to wake up on Monday morning after they have filled their bellies with chocolate eggs and bunnies? Well, in our case – not as long as you think. After hiding their eggs on Sunday in the garden as planned, we then woke on Monday morning and told them that they had not found all the eggs. Go back outside and find the remaining 6 or so before the wildlife do. There was about an extra 30mins of bliss. And then about 30mins of revenge, which was still just as funny. Nevertheless, due to Monday being April Fools Day, I had decided to allow a little extra time to see which aspiring Evil Genius Parent could inflict the most entertainment on their spawnlings. Thus, delayed publishing date. And there have been some goodies and some oldies. I really like the idea of turning onions into toffee apples. 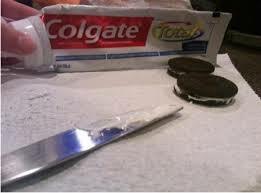 Or how about replacing the cream from inside Oreos with toothpaste? Nice. However, special mention this week goes to Lady-Create-a-Lot, who has about 12 years of experience tormenting her husband and was more than willing to share her ideas for tormenting the kids as well. On her blog, Lady-Create-a-Lot has shared at least 30 harmless (awwwww) pranks to do. I say: why restrict yourself to just April Fools Day? There’s enough here to try a new one every fortnight or so! #28 Wet Paint trick – mind you, may not work on boys. Have you ever heard of the Wet Paint Rule for Boys? #33 Alarm clocks – and with iPhones you can set more than 1 alarm very easily. Head over and check it out. Definitely a few to keep in mind for next year… Or next week.